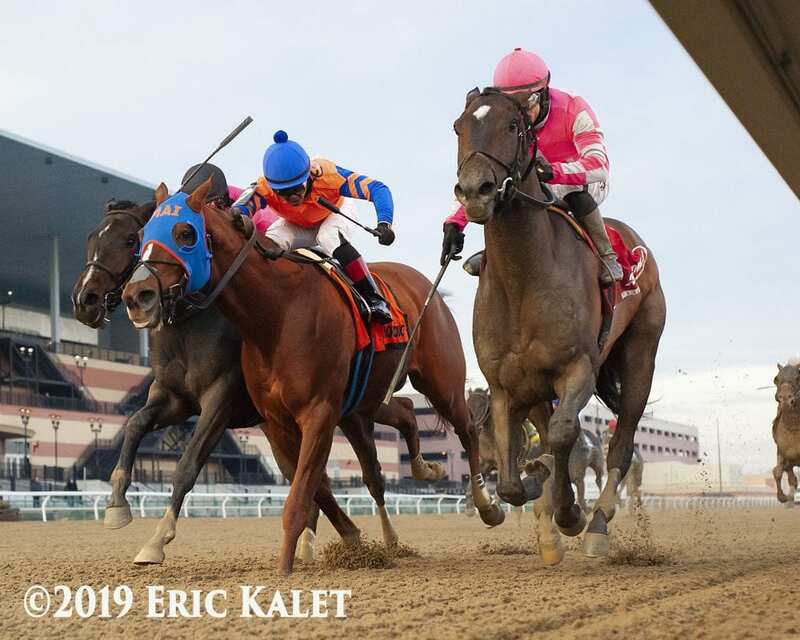 R. A. Hill Stable, Reeves Thoroughbred Racing, Hugh Lynch and Corms Racing Stable's Tax made a bullish move to gain the upper hand in Saturday's G3 Withers Stakes, forcing his way through a narrow hole at the rail and racing on gamely to hit the wire a head in front. Off as the 2-1 top choice, the sophomore son of Arch earned 10 points on the Road to the Kentucky Derby with his victory. Trained by Danny Gargan and ridden by Junior Alvarado, Tax completed nine furlongs over Aqueduct's fast main track in 1:50.27. The second and third-place finishers, Not That Brady and Our Braintrust, respectively, exchanged bumps near the top of the stretch resulting in both a stewards' inquiry and a trainer's objection. The stewards decided against changing the order of finish. Not That Brady wasn't as quick out of the starting gate as Tax, but he was rushed up four wide to take the lead in the clubhouse turn. With a 3/4-length advantage over Tax, Not That Brady set pressured fractions of :23.56 and :47.39. Our Braintrust and Admire were in close behind those, with Moretti tracking the leading group. Maintaining a short lead into the stretch, Not That Brady was challenged by Our Braintrust on the outside. Those two exchanged bumps just as Tax went for the narrow hole on the inside. A three-way battle toward the wire was on from the eighth pole, but Tax came out on top to win by a head at the wire. Not That Brady was another head in front of Our Braintrust. “I was hoping the hole would open up and I got lucky and got through,” said Alvarado. “He responded right away when we got the space, it was just enough for him. When we got to the lead at the sixteenth pole he started waiting again for the horses. He's a big guy, but mentally he's not 100 percent in the game yet. He's still learning and today was a great learning experience for him. Bred in Kentucky by Claiborne Farm and Adele Dilschneider, Tax was claimed for a tag of $50,000 in his second career start at Keeneland. The gelding won that day, and came back to finish third in the G3 Remsen Stakes in his next start. 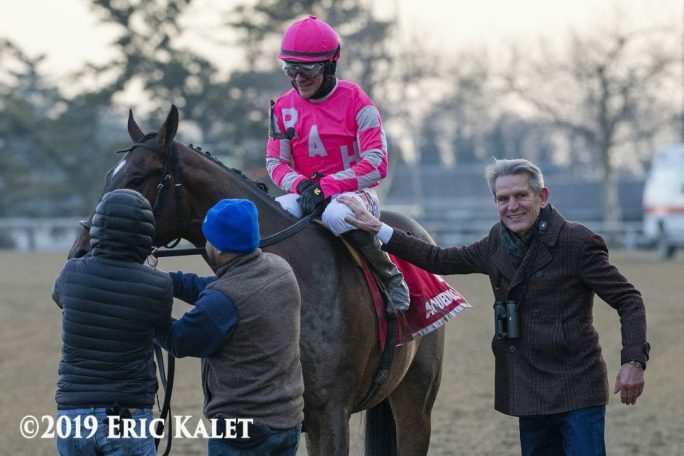 The Withers is his first graded stakes win, improving his overall record to two wins, a second and a third from four starts for earnings just shy of $200,000. “As far as our next spot, we'll look at the Tampa Bay Derby [March 9], also the Jeff Ruby [March 9] at Turfway Park,” said Gargan. “Somewhere like that, a two-turn race. I don't want to back him up, the Gotham [March 9] is a one-turn mile and I think that's a sprinter's race. This entry was posted in NL Article, Triple Crown, Videos and tagged Adele Dilschneider, Arch, Claiborne Farm, Danny Gargan, Junior Alvarado, kentucky derby, not that brady, our braintrust, road to the kentucky derby, tax, Withers Stakes by Paulick Report Staff. Bookmark the permalink.